TUCSON, AZ – The Tucson Roadrunners, proud American Hockey League affiliate of the Arizona Coyotes, continue their six-game home stretch at Tucson Arena as the club hosts the Bakersfield Condors Friday and Saturday. Friday is “Wrestling Night” featuring a special guest appearance by Brian Knobbs and Jerry Sags, also known as “The Nasty Boys”. The dynamic duo will participate in a pregame meet and greet at the arena from 6 - 7 p.m. and serve as the celebrity puck droppers for the evening. Starting at just $20, fans can get a ticket and a Roadrunners Championship Belt Wrestling T-Shirt. 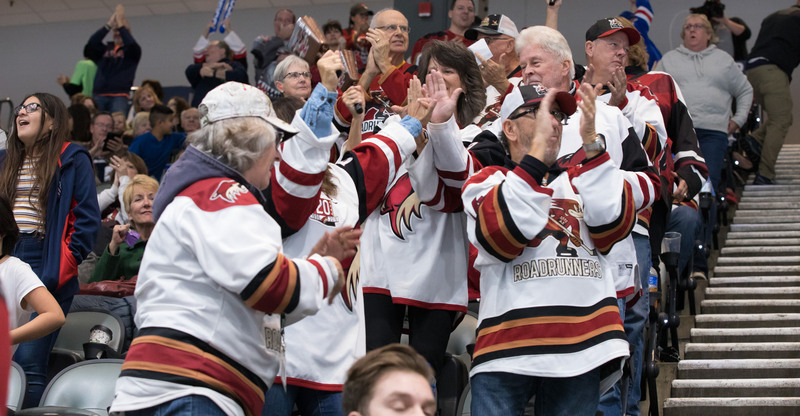 The third of six games in the stretch also is another “College Night”, which allows students with valid identification to purchase a unique ticket package containing one (1) ticket, one (1) Roadrunners hat and two (2) drinks for just $25. Additionally, the game against the AHL affiliate of the Edmonton Oilers will serve as the second “Ladies Night” of the season presented by Genisis OBGYN. Ladies interested in joining the Roadrunners for the evening will receive a pregame informational session from Tucson Head Coach Jay Varady, among others, prior to puck drop while enjoying items such as cheese and wine. Attendees will also receive a limited edition Ladies Night T-Shirt. To round out Friday’s promotions, an opportunity to bring, and feed, the whole family for just $99 can be purchased now as “Dusty’s Family Value Pack”. With the package, you’ll receive four (4) tickets and a $20 concession voucher. Friday is one of just three nights remaining this season to purchase the limited-time offer. Saturday’s game, which begins at a special start time of 3:05 p.m., is Superhero Night presented by Cox Communications. The first 1,500 fans through the Tucson Arena doors will receive a “Super Dusty” bobblehead. To purchase tickets to Saturday’s game or for additional ticketing information, click here. Join us in honoring local heroes for our First Responders Night presented by Sentinel Peak Brewing Company on Saturday, February 2. Featuring a pregame Lights & Sirens event starting at 5:00 p.m., cars, motorcycles, trucks and vehicles from the following associations will be on hand: Tucson Fire Department, Tucson Police Department, Marana Police Department, Pima County Sherriff’s Department and the Pima County Joint Technological Education District. Special events, including an on-ice scrimmage between the Tucson Fire Department and the Tucson Police Department, will take place throughout the evening to ensure a night to remember.